Below is just a snippet of April’s newsletter. If you subscribe or go to my website you will have access to the astrology section, monthly raffle and a variety of other goodies! April Blessings everyone! It seems like Mother Nature has pulled a big old April Fools’s joke on us with this crazy weather. We had a couple of spring like days and now its back to cold and damp again. My poor plants and I are not amused. But at least we are still drawing closer to warmer days at this point. April looks like it will start to get things that were stalled shifting forward again with expansive Jupiter finally endings it’s retrograde cycle that started back in December. We have a Lunar Eclipse in Libra on the 4th, the total opposite from last October’s Lunar Eclipse in Aries. Its all about balancing our individual needs and our relationship needs. Now, lets see what we have in the Monthly Specials section for April! On offer this month I have some great readings for Spring: “The Spring Cleaning” and “Spring Flower” tarot readings. In honour of April Fool’s Day there is the “Fools Journey” and “Fool’s Choice” readings along with the “Heart of Faery” and a Feng Shui reading. And over in the Reiki/Energy Work section you can find Reiki and energy work to help give you a bit of a boost. You can find Reiki sessions, Chakra Healing and Attunements, Violet Flame healing, and the Avalon Crown of Success healing. Reiki is great for flushing out the old energies that may be lingering both in our own energetic bodies and the environment around us. Happy Sunday everyone! Its Daylight Savings time for the UK today so remember to set your clocks ahead! We are into the last few days of March now and I still can’t tell if spring has sprung. My plants are confused and not very impressed to say the least. Still, we are getting closer to that time when the fear of overnight frosts are not an issue. We had the Moon in its Void of Course during the early hours this morning before it shifted into that friendly sign of Leo. This is an energy that supports our friendships and activities that warm the cockles of our hearts. Make the best of it! Now, on to the rest of the week. Monday starts off with that heart warming Leo energy still in play. We also have Venus trine Pluto where the deeper aspects of love become more apparent minus the usual stress and strains. If you have been wanting to deepen or renew a previous commitment in a relationship, now is a good time to do so. This can be an excellent time for finances and for relationships. Combine this with Leo’s vibes and we get a time where we can connect with others on a deeper level. We also have the Sun in a conjunction with the South Lunar Node which can bring on a creative release or letting go of a part of our self image that we just don’t need anymore. While letting go of something that has been a part of us for some time, regardless of whether its useful or not, can feel difficult we need to keep in mind that clearing that space allows for something new to come in that will be of more benefit to us now. Tuesday is the day that communications’ planet, Mercury, shifts on over to Aries, where it will be until mid April. Aries brings that “Just do it!” mentality where we want to just cut through all of that red tape in order to get to the point. We aren’t interesting in all of those tiny details. It can be an impatient energy where we communicate in a more direct way. So a warning comes with; be patient, don’t drive too fast and thunk before you speak. This is a good energy for those who have trouble expressing themselves to tap into. Mars also makes a shift today into Taurus, where he isn’t a happy camper. Mars can’t really rant and rave now and there is that danger of things left to boil away under the surface until they suddenly erupt. Combine this that Aries energy and we get a lot of people who think they are right, want to express that “rightness” and are being too stubborn to listen. Mars in Taurus isn’t all bad though. It brings a bit of longevity to our goals and long term satisfaction. Its a good grounding energy. Lastly, we have the Moon moving into practical Virgo on Tuesday evening. Virgo likes to look at those little details, so we could see some heads clashing between wanting to get to the heart of things and wanting to go over the finer details. This is a good time for getting organized though. Wednesday is April Fool’s Day and starts off with a sextile between Venus and Chiron. This is a short but friendly little aspect which can give us the opportunity to harmonize difficult relationships, and make some progress in our efforts to heal and rebalance. This not only affects relationships but social interactions, our values, finances, health, and spiritual connection. There is a tendency, however to want to avoid conflict by negotiating beyond what we are really comfortable with just for the sake of peace. It’s important to stand strong for your values! If you give in without thinking, you sacrifice your personal integrity. The worst case is that you allow yourself to become a victim. When we become aware of our suffering caused by unrealistic expectations, it leads us towards growth, greater consciousness, true individuality, and a greater capacity for unconditional love. We have a brief moment with this transit to facilitate change in those situations that we feel are still within our control, and to accept and adapt to situations that are out of our sphere of control. Thursday starts off with a morning Void of Course Moon. We also have a trine between Mercury and Saturn where we may find it easier to take a more practical, logical approach to any goals that need a problem solving approach. Another trine takes place today between the Sun and Jupiter. This is a supportive aspect and, according to the ancients, this is one of the most positive transits we can encounter. With the Sun and Jupiter working together we are able to work in harmony with our environment radiating warmth and generosity to those around us. So, this is a great day for all kinds of group work and projects, where you may find things come together more easily. On a more personal level this transit can make us feel more optimistic as we start to see new possibilities taking shape. Friday brings the Moon into balancing Libra where we gravitate towards things we enjoy and want to dote on, or be doted on by others. The Moon in Libra brings a couple of power days for speeches, and offering your big idea. It’s also the right mood to make amends or compromises. Creating order is also the focus, not necessarily through tidying or organizing as was the case while the Moon was in Virgo, but rather through pleasing interactions with others and aesthetics in our environment. Since this energy will be with us for most of the weekend, it may be a good time to indulge a wee bit. Have a spa day with a friend or loved one, or have a pampering night in. Beautifying our surroundings is also something we are drawn towards with the Moon in Libra, so perhaps a bit of DIY or decorating the home and garden is in order. Saturday is our Full Moon/Lunar Eclipse in Libra. It is exactly opposite last October’s Lunar Eclipse in Aries. This allows us to get the opposite perspective regarding bringing balance between our relationships and our individual needs. Think about where your heart and head were at in October and how that has changed. Once we get that chance to look at both perspectives we can make choices regarding what is best for us at this time. 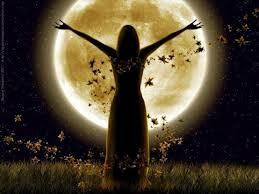 Full Moons are that time for releasing the old and breaking away from anything negative in our lives. And a Lunar Eclipse signals change in the emotional areas of our lives. And those who naturally fear change can become more tense prior to an eclipse. This is more so if they are dealing with big emotional issues in their lives. Tensions continue to build as the eclipse approaches until finally it is released with the darkening of the moon. Many can feel a sense of relaxed fulfilment, feeling soothed and calmer. As the Moon reappears there comes a sense of freedom along with a fresh perspective. Sunday brings us a challenging square between the Sun and Pluto which can bring us a day where our desires clash with our current circumstances and the demands of others. It can definitely be a time of challenge, feeling our sense of purpose, direction, and identity blocked in this way. We may feel that we are being overpowered by the powers that be and everything seems out of our hands. Some of us may find ourselves faced with difficult people and situations that mean we have to muster our strength and stand up for what we truly believe in. The trick here is to become centred in our own empowerment rather than in power alone. We also have the Moon shifting in the brooding sign of Scorpio in the evening. Sunday may be best for just having some alone time before we start the new week. Happy Sunday everyone! I hope this weekend finds you all well. We are coming into the home stretch as March enters its last week and a half. Spring is creeping in for some areas and slow to come in others. But we are not too far off from the days finally staying warmer and overnight frost a thing of memories for now. These next two weeks are between the Eclipses and tend to bring emotional ups and downs as we take a breather amidst the emotional turbulence. We have a few planetary aspects this week that are rather pleasant as well, aside from a small hiccup on Friday. Let’s take a look! We have a quiet Monday to start off our week with the grounding influence of Sunday’s Taurus Moon still with us and a Void of Course in the early afternoon. Tuesday brings the Moon into Gemini, where we want to communicate, discover, share ideas and let our curiosity run free for a bit. It makes a good couple of days for lots of talk and quick projects. There is also a sextile between Venus and Neptune happening where we get the chance to let our own inner beauty and spirit shine for all to see. With these two planet together we can open the flow of artistry, romance, creativity and faith. It’s an inspiring energy to work with. Add to this a conjunction between Mercury and Chiron that gives us the insight to see exactly what is going on in any given situation and helps us to understand others. Its a wonderful energy for negotiators, teachers, and group related therapies and business projects. These energies are further helped on Wednesday when the Sun makes a harmonious trine to Saturn, helping us to bring together our core life desires with sensible actions. This can be a really down-to-earth transit. It brings us back into contact with ourselves and helps us to get to know ourselves through our relationship with, and our effect on, our environment. This is a time to examine your habits, your home situation, your work, and everything else that is important to you. Determine how they work on a practical level. Begin organizing your life and making an overall plan. Even your relationships should be supportive now. Thursday brings us a morning Void of Course before the Moon moves into watery Cancer later in the evening. It’s a good energy for focusing on the home and what is close to us on Thursday night. Friday is where we get that little hiccup in the road with a First Quarter Moon that can bring out emotional impatience and some related minor irritations. We also have a challenging square between Venus and Jupiter that starts Friday night and extends into the weekend. This one isn’t as challenging as most squares tend to be but there is a tendency here to overextend ourselves in many ways, such as food, drink and over spending. So try to be cautious as you indulge. Saturday brings a gentler energy our way that makes it a good time for doing what our heart and soul desires. Just make sure you aren’t being overly ambitious. We still have that Cancer Moon energy here too which makes it a good time for spending time with those closest to us. Sunday is Daylight Savings Time for the UK, so remember to turn those clocks forward! We have an early morning Void of Course Moon before it shifts into Leo around dawn. This is a good energy for connecting with our inner child and letting it have some fun before the new week starts. Happy Sunday and Happy Mother’s Day to our UK Mum’s! Another week is done and a new one is upon us. I am excited about this one because we have that New Moon/Solar Eclipse happening on Friday, the Spring Equinox! So, without further ado, let’s see what this week has in store for us! Monday morning starts us off with a Void of Course Moon before moving into Aquarius where we tend to feel detached emotionally and are drawn to all that is new and unusual. We also have Mercury and Saturn in a challenging square where it can seem like getting from point A to point B is a challenge during this transit due to obstacles and delays. Communications may be blocked or delayed, and negative thinking could dominate at this time causing feelings of irritation. Projects we thought were complete may need revision, and others could appear overly critical, insensitive, or sarcastic. It can be a good time for tapping into that Aquarius energy in order to gain a different perspective on any areas that feel blocked. Tuesday brings us the 7th of 7 challenging squares between Pluto and Uranus that has been going on 2012. We have been reassessing and reorganizing the priorities in our lives all this time in order to find a better balance between our responsibilities and creative freedom. Many may have cut ties with activities and people during this time but now is when new beginnings can occur. Make sure you balance your responsibilities today and make some time for yourself. Venus will be moving into Taurus as well today, where she feels right at home in this sensual sign. Venus will be there until April 11th so we get the chance to tap into this energy to manifest our desires and needs in a more tangible way. On Wednesday the Moon moves into Pisces, joining Mercury and Neptune. This is where our intuitive creativity is stimulated. You might get insights into your own mind and/or into others’ behaviour. Our imaginations can really soar here as insights become more magical and richer. Our creativity tends to flow better, dreams become more vivid and lucid, and experiences become more likely. For those who are more sensitive to this transits energies, a need for finding quiet time to meditate or just be alone with our thoughts could be strong. Our mental focus can become a bit blurred and conscious reasoning can be distorted by subconscious matter. So concentrating on cold hard facts can be challenging. Daydreaming, visualization, and prophecy are stimulated. Communications may be unclear, vague, or downright confused. You could be subject to deception. Avoid signing contracts under this influence. Thursday is a quiet day for us to wrap up any loose ends or to just take a bit of a time out. And we will need it as we prepare for the energy coming in for Friday. Here in the UK about 95% of the Sun’s light will be blocked out. It starts just before 8:30 am and ends just after 10:42 am. The interesting part is that the Moon will be Void of Course for most of this eclipse and then entering Pisces. Astrologers in ancient times believed that Pisces last degree was a time for endings. And the Spring Equinox is the time for beginnings. So together we have this 3 month energy of endings and beginnings going on. A New Moon is also said to be a time of new beginnings and with a Solar Eclipse happening, this energy tends to intensify. We could really do some great manifestation work here regarding releasing the old and bringing in the new. This is a time when the very depths of our being can come to the surface in order to help us in taking action on soul level priorities. Saturday is a good time for wrapping up any important activities before the evening when the Moon goes Void of Course, making it a fairly quiet evening for most. Sunday morning the Moon joins Venus in Taurus, which further turns our attention towards taking care of the home and what makes us feel comfy. Mercury will be sextile Pluto, where our communication is fuelled by our passion and we can be very persuasive in dealing with others by first finding some common ground between you and them. However, we do run the risk of speaking too forcefully or being too pushy in trying to get what we want. This is a time for shedding any old and outworn perceptions we have been holding onto, as well as ways we have been communicating. We can take the information coming our way and transform these into something that can be either healing or wounding depending on how we wield them. Happy Sunday everyone! We had a few nice days for the first week of March so hopefully it will continue to get warmer and brighter. Don’t forget, if you are in the U.S.A your clocks go forward an hour today! Sunday is a quiet one astrologically speaking. We still have that balancing Libra Moon energy to work with though which makes this a good day for just chilling out and bringing ourselves, and our immediate environment, back into balance. Use this well because things will pick up at the start of this week…let’s take a look. We have an early morning Void of Course Moon on Monday before it enters intense Scorpio in the afternoon. Also to take note of is aggressive Mars making a harmonious trine with Jupiter on Tuesday. This is a transit that can have ideas flooding into our heads and us wanting to get them out, making us chatterboxes. So this is a good time for presenting any big plans. Just make sure you aren’t being too pushy with getting things accepted or in motion. Wednesday is where things get a bit tricky. We have Mars interacting with destructive Pluto and explosive Uranus. In the past we have witnesses bad things taking place under these interacting planets (aggression, explosive energy, destruction of old ways) and may see news about thing like riots, earthquakes, acts of aggression, etc. On a personal level, its better to not focus on the negative. Rather, us this energy to put physical efforts into your ambitions. Its a good energy to taking those steps to set ourselves free from anything we are finished with while we set off on a new empowering path. Wednesday night brings us a Void of Course Moon before it moves into Sagittarius just before midnight. The tone softens a bit on Thursday with the optimistic Sagittarius Moon in play and with Mercury now moving into gentle Pisces until the 30th of March. When Mercury is in Pisces, our thinking processes become visual, intuitive, and imaginative. Our brainy Mercury is less interested in the facts and more in touch with feelings at this time. We are more attuned to the world of emotion, and it colours both our thoughts and our communication style. We guess well, express ourselves with imagery, and make decisions intuitively. Minds meander with Mercury moving through Pisces, going off course to places that words cannot adequately describe. This is a chance for opening up our more intuitive side and doing things like enjoying music, meditating, or visiting a watery place can be very beneficial. Friday is a bit of a quiet one for us with a Void of Course happening just before midnight. We have the more serious minded Capricorn in play for the weekend where we can accomplish something constructive. Saturn starts it’s retrograde journey on Saturday, a directional change that tends to bring out depression. We start to feel these effects a week before the actual day. So if you are prone to depression under normal circumstances be aware of this retrograde planet’s effects and try not to take the world too seriously right now. Instead, use this time to review and revise any longer term plans from now until early August. Its important to not let yourself fret or stress over life not moving as fast as you had hoped. Its a time where patience is of the essence! Sunday is another quiet one for us and gives us a chance to recuperate from the more intense energy this week has brought us. This evening is the Virgo Full Moon. Full Moons are a time when things seem more illuminated. Where the New Moon gives us the opportunity to set our intentions in the different aspects of our lives, the Full Moon asks us to stand still for a moment and look at what has come to fruition since the dark moon. Full Moons are the best time for doing energy and spell work that is geared towards releasing something old or reaping the harvest of whatever seed you planted at the last New Moon. Virgo is obsessed with finding perfection and we instinctually gravitate towards practical activities under the influence of a Virgo Moon. If Virgo is strong in your natal chart the pull towards improvement comes more naturally. To fight this can be exhausting. However, if Virgo isn’t strong in your natal chart all of this Virgo energy can be overwhelming. This Virgo Full Moon will more than likely be quite busy, even demanding at times. But it can also be a creative, productive and healing time. Which way it goes all depends on how you choose to this energy. Virgo’s urge to set things right can lead us towards re-organizing and rethinking plans. We gain emotional satisfaction from solving problems, making order out of confusion, and helping others. Health matters might come into focus during this time too. We notice the smaller parts that make up the whole, and instead of letting nagging details bother us, we might work on ironing them out so that we can feel more confident moving ahead. Taking care of business is a major theme where our emotional orientation is concerned under this Moon’s energy. We may crave organization and practicality, and feel drawn to want to get things accomplished. We aim to have a place for everything and everything in its place – and anything that gets in the way can get on our nerves. Health and work goals take on greater importance for us with Virgo as well. Things to do under a Virgo Moon: Mental pursuits, work activities, services, and routines. Activities that would benefit from tending to details. Happy 1st day of March all! March is starting off blustery here but you know the saying, “In like a lion, out like a lamb” (and vice versa). So I am hoping that we will start to get some calmer weather soon. I want to get my garden started! March has some interesting energies at play, including the much talked about Solar Eclipse/New Moon at the spring equinox. For now, let’s see what this first week of March has in store for us! Monday itself is a quiet one aside form the Leo energy at play for the next couple of days. It brings a very warm and generous vibe and one that can lift us out of the doldrums. Tuesday starts off with a morning Void of Course Moon and a trine between Jupiter and Uranus. Many see this trine between Jupiter and Uranus as a favourable one that brings good fortune our way and opportunities that benefit us. This means we need to be open to everything that comes our way and take opportunities when they arise. Pleasant surprises can brings us some welcome change in areas of our lives that have been feeling dull. Mercury will also be leaving the final bit of its shadow from its retrograde cycle so we may start to notice what was stuck or slow going start to be put to rights. Wednesday gives us a Virgo Moon where we tend to want to focus on the practical tasks, spring cleaning, new health regimes and service to others. Venus is busy today as well with a trine with Jupiter and a conjunction with Uranus. The Venus/Jupiter aspect is a happy little trine that can draw those to us who appreciate who we are and are willing to lend support. It brings some contagious optimism and stimulating conversation too. If you have been trying to get people on board with a project or idea, this is a time when it will be easier. The Venus/Uranus aspect itches for change on a social and romantic level, as well as the area of finances. Paired with that Virgo energy we may fins ourselves re-arranging and re-assessing these areas of our life now. Lastly we have a conjunction between Mars and the South Lunar Node and this can be a somewhat prickly and impatient transit, as well as active and energetic. Thursday is the Full Moon, which is still in Virgo. And not too soon after the Moon goes Void of Course. Full Moon’s are a time for listening to our inner selves, releasing what is done or no longer useful to us. Since it is between signs it can feel a bit confusing to some. But it is a powerful time for sitting quietly and letting these energies speak to you. Venus will be square Pluto as well and this transit can bring on power games as passions run high and hot, with some hidden agendas. Feelings of jealousy and possessiveness run so close to the surface that others can almost feel the heat, and they are in direct proportion to your fear of losing something or someone dear to you. Avoid starting a new relationship at this time, because it can be characterized by these energies. Friday brings the Sun into a sextile with Pluto and under this transit we can feel our sense of purpose grow stronger, allowing us to tap into the deeper levels of our energy stores and determination. We also gain the ability to be able to see below the surface of things. We may not be able to understand what it is we are seeing but we can often get to the core of unconscious patterns that need changing. Some of the insights we gain now may not bring about a “light bulb” moment until later down the line. The weekend starts off with Saturday’s Libra Moon and makes a good time for bringing balance into our relationships and sharing some time with those we love. We also have the Sun in a conjunction with the Wounded Healer Chiron. So, over the next few days we will notice that we turn our focus towards our own healing needs. Our energy levels may be more open to health issues, making us feel somewhat drained. Spiritually we may feel a bit lost and vulnerable regarding our sense of purpose. We become more aware of how our self-esteem is being undermined either as a result of outside influences or through our own self sabotaging habits. Good thing we have that balancing Libra Moon to help us out here! Sunday is quiet and it is also US Daylight Savings so all of you folks in the US remember to turn those clocks ahead! The UK won’t be turning theirs ahead until the end of the month so remember that there is that 1 hour less time difference between the US and the UK.